Your company image is one of the most important assets you have. When people see your business in a positive light, they are more willing to trust you and have more brand loyalty. Unfortunately, building and maintaining a perfect image can be difficult. Businesses are trying everything to improve their image and create a better relationship with their customers. One of the main tactics used in improving brand image is to focus on improving customer support. Customer support, sometimes referred to as the “complaints department,” has the power to greatly influence buyers. Here are just some of the ways businesses are enhancing their customer care departments to boost their image. It’s no secret that social media networks have a huge influence on business. In fact, Facebook and Twitter have completely changed the way most companies are doing business. These networks aren’t just good for roping in new leads or sending traffic to your website. The biggest benefit of social media is that it allows you to make a direct connection with your customer. Because people are easily able to seek out their favorite brands on social media, having an active profile is a must for any modern business. Some of the most successful businesses are taking it a step further, offering full customer support on each network. This not only encourages users to come directly to the brand with any issues they may have, but it also allows the brand the opportunity to create a solution in a relaxed, casual environment. Most businesses that are turning Twitter or Facebook into their customer service department hire dedicated staff members for each account. While this can be helpful, especially when those team members are already well-versed in social media marketing, this is unnecessary. If you are relying on social media solely for customer service aspects, most of these tasks can be automated using customer support software. Software allows you to collect all social media inquiries and send them to a central location. This allows them to be handled like any other customer service request. Software eliminates the learning curve that social media brings and allows you to focus more on servicing the customer, thus improving your image. Another innovative tactic people are using to improve their customer service department is automating simple tasks to reduce wait time. Automation is a hot topic in the business world, because people often associate it with job loss. When it comes to automating customer care, this couldn’t be further from the truth. Instead, automation makes the job of each representative a lot easier, allowing them to work more efficiently and do more each day. Messages – Let people know that you received their request by automatically responding to them. Sorting – Send requests to the correct department right away. Respond – Answer simple questions without the help of a representative. Convert – Create tickets for each inquiry that can easily be viewed and monitored. Notify – Let representatives know when they have a new ticket instantly. Report – Create reports based on previous activity with the touch of a button. The truth is that the more you automate, the more you can do. This allows you to better service your customer, thus improving your image. Transparency – Allow people to research common issues your buyers have. This doesn’t just reduce the number of overall inquiries; it lets people see you as a brand that truly cares about its customers and the experience they have. Some shoppers may even see you as more honest, especially if you openly discuss common problems and how to solve them. Speed – Customers will be able to find the answers they need right away, without having to wait to connect to a representative. This makes it seem like your business cares about not wasting people’s time and efficiency. Better Experience – Your customers will be able to get the help they need even outside of regular office hours. This makes it seem like your company is always available and always willing to help your customer, even if your customer service department is closed for the night. While improving the customer experience is the most important reason to have a knowledge base, keep in mind that this page can double as a resource for your team. Your customer service representatives will also be able to easily look up answers to customer inquiries. Providing fast, uniform and accurate answers gives people the impression that your staff is well-trained and professional, even if it’s their first day. Customer service and help desk software can really change the way people think about your company. Whether you are focusing on making a direct connection through social media, improving efficiency with automation or providing instant access to answers using an online knowledge base, software makes it happen. Look for a customer support solution that combines all of these aspects into one platform. 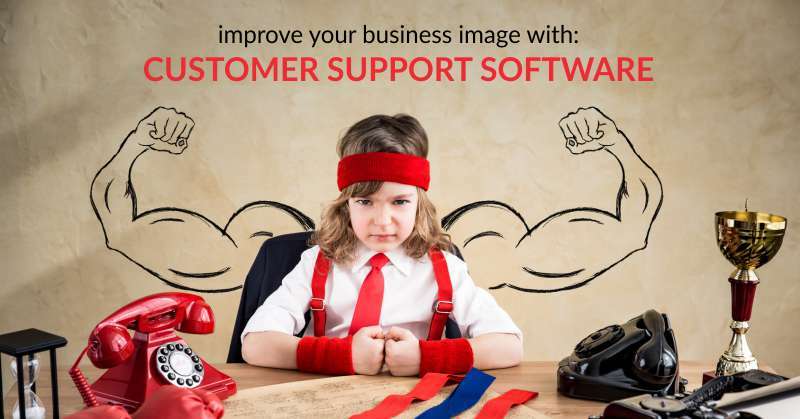 The best support software will encourage you to use multiple channels to better service your customer. To learn more about some of the best customer support software solutions available, contact us today.